Can I say some things without it sounding awful? Will I sound rude or ungrateful? Anyone who reads my blog should know better. There are a kabillion things I can think of that I want for Christmas, but there are also a few things I don't want. They can be kind of hard to say, however, because they could offend someone. I don't want Christmas dinner. I know my husband loves making it. And it's always delicious. And of course I don't hate it. But.....it's just all this work that I have to clean up and Christmas itself is a lot of work and....why can't we just chill? Luckily, with a little coaching on just the right language to use from a friend, I managed to talk Mark into doing our big meal on Christmas Eve instead. I had to be very careful how I presented the idea to him because cooking for people is a big way Mark shows his love. I brought it up last year and it was like I stuck a knife in his heart. I don't want to be asked what I want for Christmas. Of course I don't mind the desire to give me a gift. Who would? There's stuff I want! The thing is....if you feel close enough to me to want to give me a gift, shouldn't you be able to think of something I'd like? Because when you ask me what I want, it makes me feel like I'm asking you to give me something. And then I feel greedy (I already feel bad enough for specifically asking my friend Jessica to make me a knitted purse). I know that's not your intention, but it still feels that way. I really think we should only ask kids what they want. Because rattling off their little list is fun for them. Thinking of something to give someone shouldn't be that hard. All you have to do is think about what interests them. Do they have any hobbies? What do they do every day? Think about their home. If you're still stumped, gift cards are awesome! My BFF is most excellent at taking note of things I say in email conversations with her and using those tidbits to come up with gifts I always like. I don't want it to just rain. Is it really too much to ask for a white Christmas? I'm talking to you, Mother Nature. I don't want my husband to have any new medical problems. Christmas Day 2008 he had his first heart attack. Christmas 2010 he was just recovered after bypass surgery. Only days before Christmas last year he had to have an infected chest wire from his bypass removed. In fact, I'll be hard-pressed not to be holding my breath as Christmas approaches, I think. 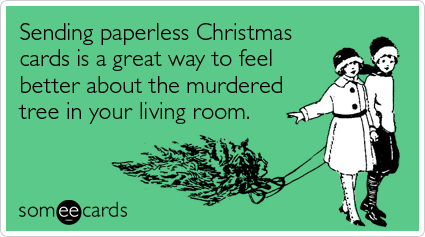 I don't want to be scolded for not phoning family members on Christmas Day. This I really resent. Why should it matter one iota who calls whom on a holiday? Does it specifically have to be children calling parents? Why can't it be the other way around, as long as we connect somehow? AND, if I remind my husband to call his family, should I be lectured on the insensitivity of it all when he forgets? I think not. What you're saying by expecting ME to be the one who calls is that you're too stubborn to pick up the phone yourself. We have kids to pay attention to on Christmas. There are gifts to open, wrapping to clean up and toys to pry out of their packages and make work. Somewhere in there we also need to eat and take a breath. Doesn't mean I don't want to talk to you and wouldn't love to wish you a Merry Christmas. I just may very well forget to be the one to make the call. Really, the older I get, the more I just want a peaceful, happy day during which I can do whatever I want and nothing I don't. I want to watch my children delight in their new treasures, sip on drinks, nibble on treats, give lots of hugs and I love yous and call it good. Is there anything you DON'T want for Christmas? Is there anything you feel obligated to do, but really don't want to?